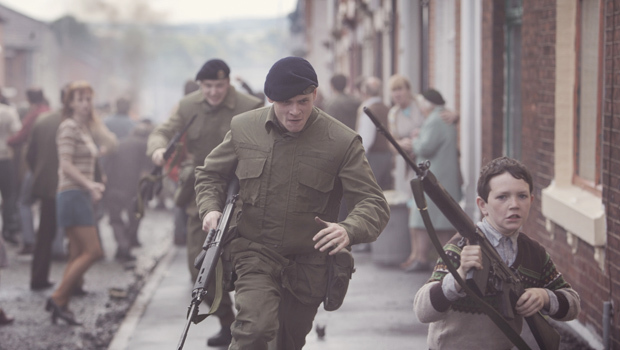 NYFF review: An incendiary Northern Ireland in "'71"
It is 1971, and you are a rookie British soldier trying to keep the peace in Northern Ireland, as a bulwark between the restive Catholic and Protestant enclaves of Belfast. You are alone, separated from your unit, and without your weapon. This is not where you want to be if your intention is to live. Director Yann Demange's very impressive new film, ''71" (which had its U.S. premiere today at the New York Film Festival), boasts a sparse narrative set in the claustrophobic no-man's-land straddling the city's warring neighborhoods. It effectively places the viewer in the shoes of a young soldier desperately trying to avoid an assassin's bullets and regroup with his compatriots. There is little in the way of backstory for the central character, Private Gary Hook (Jack O'Connell), except that he has family ties to a young boy back home in Derbyshire. His enlistment and boot camp training, he thinks, will take him to Germany -- Join the Army and see the world! -- but the Troubles embroiling Northern Ireland steer his unit to Belfast. Driving in armored transports through desolate city streets blocked by burning vehicles, pelted with rocks by schoolboys and cursed by young mothers pushing strollers, the terse Hook makes his thoughts quite clear to the audience: This isn't what I signed up for. To view a clip from "'71" click on the video player below. But it is exactly his military training that will keep him alive, once his unit is beset by rioters during a raid on an IRA member's house. The young man's uniform carries a target for half of the people he's been called to police, and the film's cinematography and editing expertly thrust us into the whirlwind of chaos as the security forces come under siege by men, women and kids. Hook chases after a young boy who has picked up a soldier's automatic weapon, and is soon cornered and beaten. The violence only worsens, and in making his escape Hook finds himself deep within "enemy territory." Hook's simple need for an escape route to freedom is complicated by the workings of undercover British Intelligence officers who have infiltrated the IRA, and whose agenda does not necessarily include assuring safe passage for a wayward soldier if that soldier's presence threatens their carefully-crafted network. Written by acclaimed playwright Gregory Burke ("Black Watch"), "'71" is the first theatrical film for director Demange, whose TV credits include the British series "Criminal Justice" and "Top Boy." It is as assured a feature debut as has been seen in a very long while, though much credit should also go to cinematographer Tat Radcliffe, editor Chris Wyatt, and sound designer Paul Davies. While no U.S. release date for "'71" has yet been announced (distribution has been picked up by Roadside Attractions), American audiences will soon have an opportunity to see the very fine O'Connell as the star of Angelina Jolie's "Unbroken," based on the true story of Olympian and WWII prisoner of war Louis Zamperini. A girl and her bees in luminous "The Wonders"
A scathing "Maps to the Stars"
The romantic triangle "Beloved Sisters"
Crimes of passion in "The Blue Room"
The beautiful and haunting "Timbuktu"
The fiery firmament of "Mr. Turner"
Paul Thomas Anderson's "Inherent Vice"
A DJ's raves in "Eden"
Kristen Stewart, Juliette Binoche in mesmerizing "Clouds of Sils Maria"
The documentary "Merchants of Doubt"
Actors, camera soar in surreal "Birdman"